There are things that are so important to us that, when we speak about them, we speak with passion, meaning and depth—our words flow, bursting with emotion. And then there are things that shake us to the core, and the core of our being is not able to wait for the mind’s permission or for the right words. There are no words that can contain this feeling—it breaks out in a cry. This is the sound of the shofar—a cry, not even of a human being, but of an animal’s horn. We need the animal, not for its coarseness, but for its simplicity of primal expression that the mind can neither fathom nor hold back. This in fact is the Tikun –rectification, as the Arizal writes for the tree of Knowledge, the reality of opposites and duality, and reclaiming the Tree of Life, the reality of Unity. A shofar with its narrow mouthpiece and wider opening resembles a birth canal. In fact, the Torah mentions a great woman with a related name, Shifra, who was a midwife to the Israelites at the time of the birth of Moses in Egypt. Her name means “to make beautiful,” and that is what she did: she ensured that the babies would emerge healthy and viable, then swaddled and massaged them to foster their strength and beauty. Every year before the bellowing of the shofar there is a great cosmic inhale, and retention and only later, at the blowing of the shofar, is there an exhale, the filling of the cosmic void with life and renewed energy. New life enters our world and takes its first breath. It is our own life, as well, and it is in our hands. Everything is rooted in the Name of Hashem, and when we blow the Shofar we are being the agents to bringing down Hashem’s light into this world, we are filling –with our breath – the “empty space” of creation with Divine light and blessings. As a reflection of this process the act of blowing of the Shofar mirrors the four letters in the name of Hashem. The Shallah Ha’kodesh (Meseches R’H. p.169) writes that the Yud is the small opening of the mouth that blows, the Hie is the widening breath, the inhale. Vav is the sound, and the exhale, the out breath is the final Hie. There are two aspects to this Talmudic teaching: first, that we must recite these Scriptural verses, and second, that we must conclude them in a particular way—by blowing the shofar. When we conclude reading the Scriptural verses regarding God’s kingship (malchiyos) we say, “Assume kingship over the entire world,” and we blow the shofar. When we conclude with the Scriptural verses regarding God’s remembrance (zichronos), we say, “Remember us for goodness,” and we blow the shofar. And when we conclude the verses regarding the shofar (shofros) we say, “Blow the great shofar and redeem us,” and we blow the shofar. Although the Talmud’s instructions are scant, somehow and for some reason the malchiyos, zichronos and shofros became the crux of Rosh Hashanah prayers. This is particularly curious because each of these three groups present us with problems. The idea of Hashem being anointed king by us is strange. One human being can nominate another human being as his ruler and master, as his king, but what power does man have to anoint the Creator of the universe as king? The idea that Hashem remembers is strange. The reason we human beings remember is that events of the past become imprinted on our present, otherwise we forget; this happens because we operate in a time-based reality, where the past is generally not felt or seen in the present. But Hashem, who is beyond time, is not susceptible to memory loss; for the Creator of time there is no past and so there is no possibility to forget. If this is so, what does it mean that Hashem remembers? The idea that reading about the shofar should awaken Hashem by its blast is strange. What is the relationship between the sound of shofar and the events that occurred when the shofar was sounded at other times, such as the giving of the Torah at Mt. Sinai? Rosh Hashanah celebrates a new year, a renewal of the Divine desire to create, sustain and give life to physical reality, and rule over this kingdom. As explained earlier, the essence of Hashem is beyond kingship, yet there was a Divine desire for a kingdom, which required the creation of an existence that assumes separateness, so that through the exercise of its free will, this existence (us in particular) would introduce Godliness throughout the entire universe. It is not that it had to be this way, rather that Hashem desired it this way. Indeed, this is exactly what our service during the course of the holiday entails. We awaken in Hashem a new want and desire to rule and sustain us with goodness and blessings. To arouse the Divine desire to nourish all of existence, we crown Hashem our king. This is the idea of malchiyos. Though in reality our finite activities below are a great distance from Above and cannot truly influence the Infinite, nonetheless it is the will of Hashem, however we understand will, that this should happen. The idea of zichoronos is similar. To remember an event from the past is to bring into consciousness a residue of that event or experience; it is a way to capture that which is now no longer. We seek to capture the memory of our ancestors and use it to influence Hashem by reminding Hashem of the times their actions, and the covenant with them, moved the Above to respond with compassion. Even though human actions may be minuscule in significance, we ask that a Divine arousal should occur on a level which is far beyond anything we can do or say, and from that infinite source, Godliness should imbue our lives with blessing and radiance. Still, on the deepest level, no actions outside the Divine essence itself have any power whatsoever. The ultimate revelation of a new awakening is from a spiritual place that is totally transcendent of all limitations and all actions. This is why the shofar is sounded. The sound of the shofar expresses the essence of sound beyond anything that can be linguistically differentiated—it is a sound beyond language, the deepest of expressions. We below mimics the supernal above and sounds the shofar to express the essence of the infinite, that which is completely above. Furthermore, on Rosh Hashanah we pray that the new revelation of the coming year should emanate from these deepest levels. The power to awaken these levels comes from the Torah. The Torah and Hashem are one—the Torah is the Creator deepest wisdom and will that is revealed to us. By reciting verses of Torah, we connect with the essence of the Creator and through the Torah’s power inspire a revelation of the deepest order. Since creation on all levels corresponds to the ten sefiros—the ten spheres or channels of Divine energy with which the Infinite created the world and which continue to imbue all aspects of existence—each group of malchiyos, zichronos and shofros contains ten verses of Scripture, so that a mirror reflection of the highest levels of Godliness should be revealed on all levels of existence. Before we delve into some of the mystical secrets of blowing the shofar on Rosh Hashanah, we need to understand why we sound the shofar in the first place. When the Torah speaks of Rosh Hashanah, the first day of the Seventh Month, it simply says, “This shall be to you a “day of teru’ah”. The sages of the Talmud (Rosh Hashana. 33b) understand this to mean that it should be a day of sounding the shofar. Therefore, as another Talmudic passage says, we sound the shofar simply because “Rachmana amar teko,” ‘the Merciful One says to sound it.’ Ultimately, we don’t need graspable reasons for the mitzvos, for they are rooted in the absolute simplicity of Hashem’s Unity, and reasons suggests something outside itself. Nevertheless, we are thinking beings, and we are created to seek meaning. Therefore, we may also explore ethical, philosophical, and mystical ‘reasons’ for the mitzvos. For example, the great “lover of reason”, the Rambam, Maimonides, writes that we sound the shofar in order to awaken teshuvah within ourselves. The sages and mystics offer many more reasons for every detail of the mitzvah of sounding the shofar. We will now explore a compilation of ideas that will help us understand–and feel–the sounding of the shofar, with new depth. The great Eleventh Century commentator, Rabbi Shlomo Yitzchaki, otherwise known as Rashi, writes that when the Satan sees that we honor and love the mitzvos so much–that we take it upon ourselves to do an ‘extra’ set of shofar blasts–the Satan is dumbfounded and cannot prosecute humans for their mistakes. 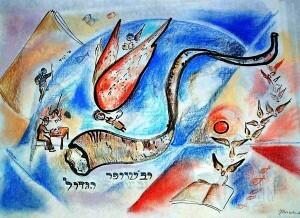 Rashi’s grandchildren, the authors of Tosefos, write that the second set is associated with “the sound of the Great Shofar”. The Great Shofar, according to prophecy, is a mystical sound that will mark the beginning of the cosmic Redemption. When this time comes, “death will be swallowed up”–all separation and evil, and therefore the Satan itself, will vanish. Therefore, when the Satan hears our second round of shofar-blasts on Rosh Hashanah, he becomes agitated and cannot focus on prosecution. The Ran, Rabbi Nissim ben Reuven of the 14th Century, writes that the “Satan” is none other than the adversary that dwells within our own lower selves–the inclination to oppose goodness and truth. According to the Ran’s insight, we blow the extra sounds to quiet this inner adversary. The literal meaning of teru’ah, ‘sounding the shofar’, is “breaking”, from the word re’u’a, ‘broken’. The sound of the shofar is also said to be mishpashet–it ‘spreads out’, breaking down barriers in its way. Amos 3:6 says, “Could the Shofar could be blown in the city, and the nation not tremble?” The shofar was sometimes sounded to alert the public of an ensuing battle. This sound inspired fear, ‘breaking’ people’s humdrum state of mind. This could be one reason that the Rambam says the shofar awakens teshuvah. The sound spreads out into the ego, as it were, causing the inner adversary to tremble and break down. The sounds of the first set are called “sitting sounds” because we are technically allowed to sit while listening to them. Allegorically, however, “sitting sounds” can mean that the sounds themselves sit down. When a person sits down, the straight line of his standing body is ‘broken’ into angles. Part of the line then extends horizontally, ‘breaking’ the space around the line, and expanding into that space. This is an illustration of how the sounds of the first set expand into the inner space of the ego, and break the inner Satan. The sounds of the second set are “standing sounds”, because we are standing in the Amidah prayer when they are blown. As a person stands, he no longer expands into horizontal space as in sitting, but he straightens the line of his body, bringing the space around him closer, and lifting his energy upward. This really ‘confuses’ the Satan, for after he is ‘broken’ and sent away, suddenly he is ‘included’ and ‘lifted’. The word iruv, ‘confuse’ is from the word ‘to mix in’, or ‘to include’, and it’s also related to the word meaning ‘sweet’. As we ‘include’ our neutralized inner adversary, we sweeten it, or elevate its nature. This is called ha-m’takas ha-din, ‘sweetening the judgment’. Before we sound the first set of shofar-blasts, we recite selected verses from Psalms that prepare us to meditate deeply on the sound of the shofar. In the first selection, Psalm 47, the name Elokim appears seven times. Elokim represents Divine constriction or concealment. By reciting this name seven times, we begin to break through the seven veils that conceal Reality. We then recite the verse (Tehillim, 118: 4), ‘From a place of constriction I call upon Hashem; answer me from a place of expansion.’ Again, we are focusing upon overcoming adversarial energies, moving from a state of inner constriction to a state of expansion. Next, we recite six verses. The first letters of these verses (the acrostic) spell out “kra satan,” ‘rip apart the Satan.’ Finally, we repeat a verse from Psalm 47: “Ala Elokim b’teruah,” ‘Elokim is elevated with a teruah.’ When the shofar is blown, the name Elokim itself will be elevated to a more expansive level, dissolving all spiritual opposition. The word shofar itself implies constriction, and the blowing of the shofar symbolizes a blowing open of all constriction. Shofar is spelled with a Shin, Vav, Pei and Reish. Numerically, Shin is 300. Pei-Vav is 86 and Reish -200. All these three numbers are intricately connected with the name Elokim-judgment and constriction. Aleph -1. Lamed-30. Hei-5. Yud-10. Mem-40= 86. Three Hundred is the numeric value of these same 5 letters, counting the full value of each letter. The letter Aleph is spelled Aleph-1. Lamed-30. Pei-80 =111. The letter Lamed is spelled Lamed-30. Mem-40. Dalet -4= 74. The letter Hei is spelled Hei-5. Yud-10=15. The letter Yud is spelled Yud-10. Vav-6. Dalet -4= 20. Two Hundred is the numeric value of these five letters when cumulatively counted. Aleph is =1. Aleph Lamed =31. Aleph Lamed Hei =36. Aleph Lamed Hei Yud =46. Aleph Lamed Hei Yud Mem=86. 1+31+46+86= 200. When we take a shofar in our hands a blow through the Name of Elokim we are, with the proper Kavanah-direction of mind and heart, opening, blowing asunder all restrictions. In the second set of shofar-blasts, the verses we recite begin with “Lo hibit avon b’Yakov,” ‘Do not see any fault in Jacob.’ The word Yakov is related to the word ‘heel’. This verse therefore suggests that now we need not focus on or fight with any obstruction within our ‘heel’, our lower self, for the negativity of the Satan has already been neutralized. We are now tasting the expansiveness of the future Redemption. During this part of the service we also recite verses urging Divine Reality to “reign over the entire world,” verses affirming Hashem’s remembrance of the love for us, and verses describing how Hashem was revealed to us on Mount Sinai. Some verses speak of the Great Shofar that will announce the coming Redemption of humanity. The sound of the Great Shofar will gather us as we leave the Exile, uniting us: “…they will come from Ashur and from Egypt.” All of these verses suggest a theme of bringing separate parts together, rather than spreading out and breaking apart. *Unification is the secret of ‘sweetening’. The word shofar is spelled Shin-Vav-Pei-Reish. We can split up this word and analyze it in order to derive spiritual meaning. Pei and Reish (or ‘par’) together have a numerical value of 280. The number 280 is also the sum of the “mantzpach”, the five letters of the Hebrew alphabet that change shape when they appear at the end of a word (Mem/40, Nun/50, Tzadik/90, Pei/80, and Chaf/20). Because these shapes appear only at the ends of words, the mantzpach letters are considered ‘limiting’ letters; thus they represent the five gevuros, or dinim, the five basic forces of constriction and concealment in the universe. Shin and Vav together spell the word shav, ‘equal’. Thus, the ‘shav par’, the shofar, unifies and equalizes the constrictive gevuros and their expansive opposites, in such a way that the forces of judgment throughout the world are sweetened. When this sweetening is accomplished, then the Divine will of the Merciful One will reign over all the earth. May we merit to experience this inwardly and outwardly. *According to the Ran, Rabbi Nisim Ben Reuvein of Girona (1320-1380), we blow the first set, the “sitting” sounds, to confuse the Satan. Thus, he explains, the “main” set is actually the second of “standing” sounds. * There are different types of sounds blown throughout the shofar services. Some are staccato and others are extended, unbroken sounds. The Torah tells us to do teru’ah on Rosh Hashanah, which etymologically suggests making broken sounds, or sounds that break obstacles. Yet, with regard to the Great Shofar of the future Redemption, it says “On that day the Great Shofar will be taka,” alluding to the unbroken, drawn-out sound called tekiah. This is a sound of strength and confidence, rather than brokenness. “Tekiah” comes from the word teka, which can mean physical intimacy or coupling. (Yevamos, 54a.) Therefore it’s a sound that “gathers” and unites. When Rosh Hashanah falls on Shabbas, the shofar is not blown, in accordance with the decree of the 4th century sage Rava. Rava reasoned that an ignorant person might be moved to carry the shofar to a more learned person so the latter can show him how to blow it, and thus violate the Shabbas prohibition against carrying objects. Therefore, in order to protect the sanctity of Shabbas against a possible violation, he forbid the blowing of the shofar on Rosh Hashanah when it coincides with Shabbas. The question is obvious: How can this great and important mitzvah be set aside because of a worry about an unintentional violation by some ignoramus? Should we all negate this lofty mitzvah just because one individual might carry the shofar? From a spiritual point of view, the fact that we are told not to blow the shofar on Shabbas indicates that, on a deeper level, we don’t need to blow the shofar on Shabbas. What occurs spiritually on the weekday through the blowing of the shofar, occurs spiritually on Shabbas on its own, precisely because the shofar is not blown. The idea of blowing the shofar is to awaken a renewed Divine desire and want for kingship, but since on Shabbas this desire is awakened Above on its own, there is no reason for the shofar. But this awakening does not only come from Above; as the entire theme of Rosh Hashanah suggests, it too comes from us below. However, unlike on the weekday when it comes as a result of our actions (i.e. as a result of the blowing of the shofar), on Shabbas, it comes as a result of our inaction (i.e. as a result of our refraining from the blowing of the shofar). To awaken the Divine desire for kingship above, we below demonstrates surrender and self-nullification (bitul). The shofar expresses these sentiments and evokes them in the one who blows it and in those who listen to its sound. Such is the service of Rosh Hashanah on the weekday. We express via the vehicle of the shofar and its sounds, a measure of surrender, of self-nullification. But in order to accomplish this end, we must act—we must blow the shofar. And since any act requires an actor, there is always a self that is necessarily being expressed to some degree. The intensity of Shabbas is of a higher order. We reach such a level of self-nullification that there is no need for any activity whatsoever—even an act expressing a self. By intentionally not blowing the shofar, we demonstrate a state of much higher bitul when the illusion of separateness between us and our Creator begins to disappear. In the Holy Temple in Jerusalem, the shofar was blown even on Shabbas, because there the state of bitul was so penetrating that there was no separateness at all. Everyone’s existence simply expressed Divine desire, whatever it may be—to act or not to act was the same. Outside the Temple on Shabbas, we don’t act, we don’t blow the shofar. But even then, our inactivity is to some extent an expression of self. Certainly to act is to express oneself, but so is not to act—there is an expression of some aspect of self in the choice not to express another aspect of self. The level reached in the Temple transcended all aspects of self. Acting or not acting made no difference, since there was no self. And if the Divine desire was for the shofar to be blown, so it had to be, this is a blowing from a Unified reality of Essence.